In the world of vacation and travel, one way to enhance the pleasantness of the word “lake” is to add the word “resort.” Connecticut melds the two images wonderfully at its lakeside resorts, where fine service and luxurious amenities are presented perfectly to create a dream vacation. Image a rambling main residence or shoreline cottages, a sandy beach and fire pits, water sports, and farm-to-table dining -- all spread alongside a beautiful, serene body of water. For a vacation of vigorous water play and boating, sunbathing, or pure rest, a resort on one of Connecticut’s sparkling lakes is what your body and soul are craving. 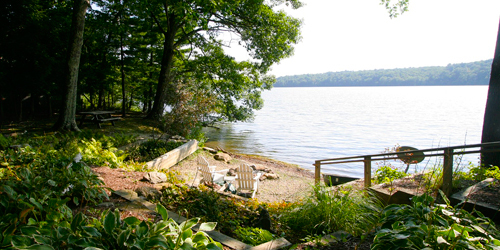 For those who love the lake life, Interlaken Inn is ideal, with its 30 acres tucked between two lakes in the lovely Litchfield Hills of Connecticut. Whether you are in the main building, a fireplaced suite (check out the penthouse suite with its private rooftop garden) or in a fully equipped secluded cottage, you’ll enjoy not only luxurious accommodations but access to all Lake Wonoscopomuc has to offer, from swimming to canoeing and kayaking (both provided by the inn). For true lake fans, the lakeside cottage has a private lakefront with a firepit at water’s edge and your very own canoe. Morgan’s restaurant offers casual farm-to-table dining, an onsite spa beckons, as do gorgeous gardens, perfect for strolling.